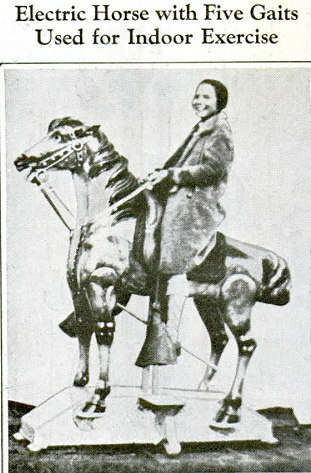 The Peace Pilgrim (aka Mildred Lisette Norman) is fairly famous. 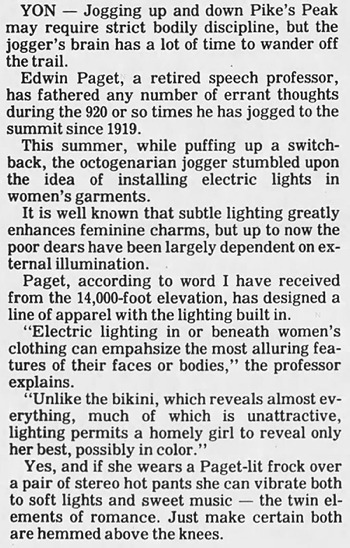 In 1953 she began walking across America, wearing a shirt that said "Peace Pilgrim," and vowed to keep walking "until mankind has learned the way of peace." She was already an experienced walker when she started this, having been the first woman to hike the entire Appalachian trail in one season. She walked for 28 years until her death in 1981, logging over 25,000 miles. 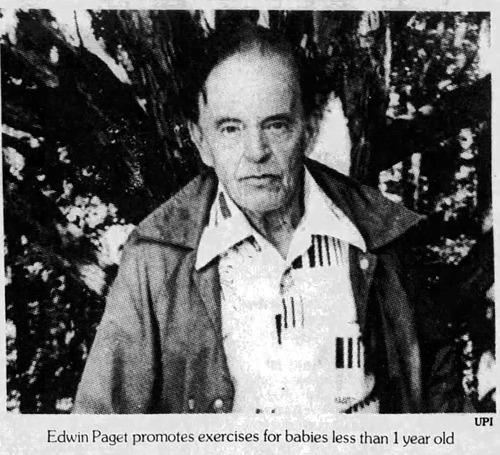 Peace Pilgrim II was only able to walk the first year of his pilgrimage. 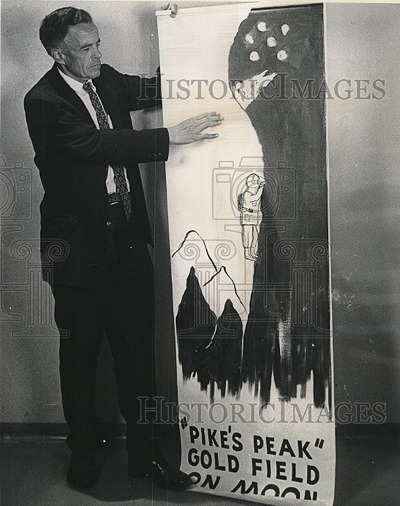 After 2,000 miles on foot, his hips required surgical replacement, but he continued his pilgrimage thereafter with the aid of a donated car and Social Security benefits. 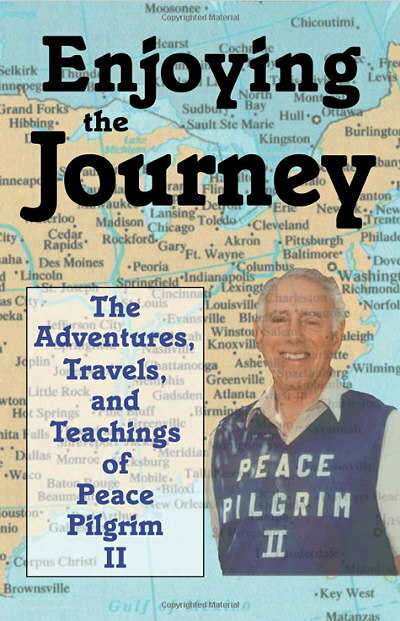 Peace Pilgrim II wrote a book about his experiences, Enjoying the Journey: The Adventures, Travels, and Teachings of Peace Pilgrim II. 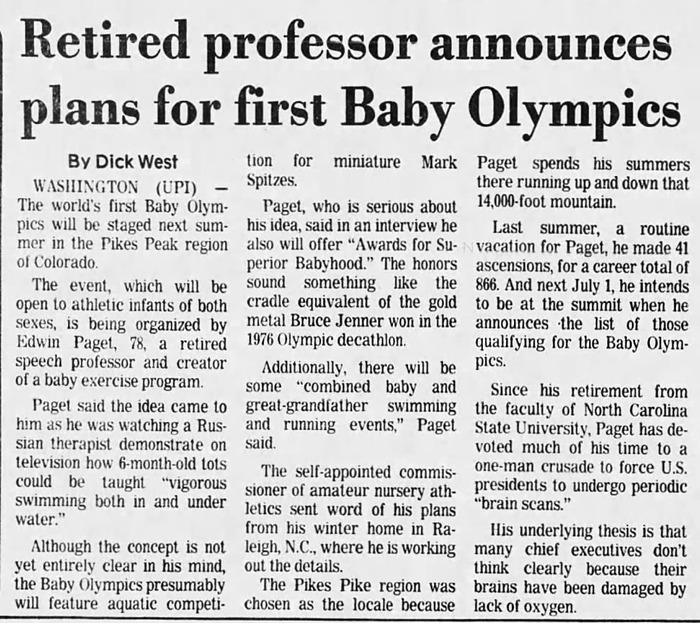 It was published in 1995. 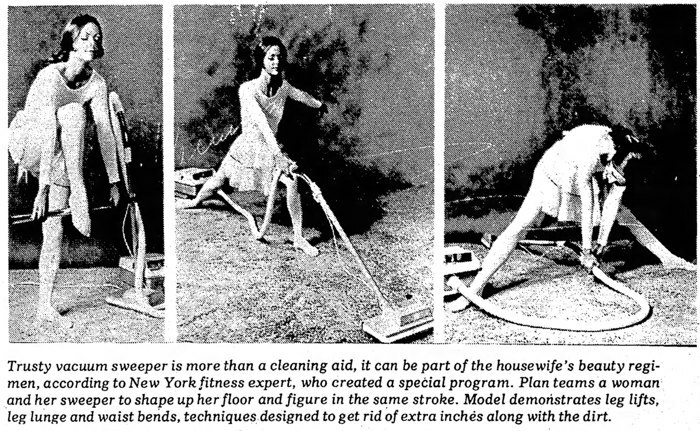 In 1972, Sears, Roebuck & Co. commissioned fitness expert Nicholas Kounovsky to devise exercises that could be done by housewives while vacuuming. He came up with the "Chore Your Way to Fitness" program. 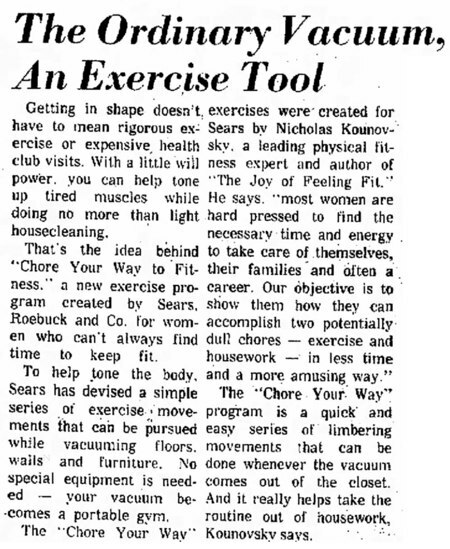 He wrote, "Your vacuum cleaner becomes a portable gym, and you can help tone up lazy muscles as you do your routine cleaning chores." 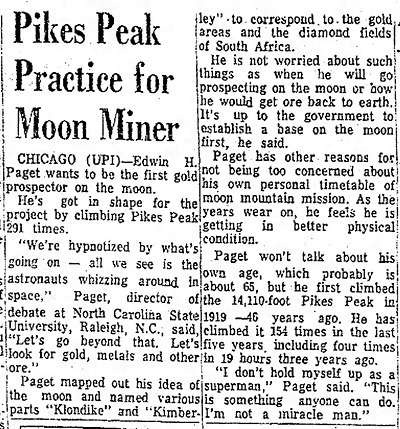 It sounds like this program was outlined in a pamphlet of some kind. 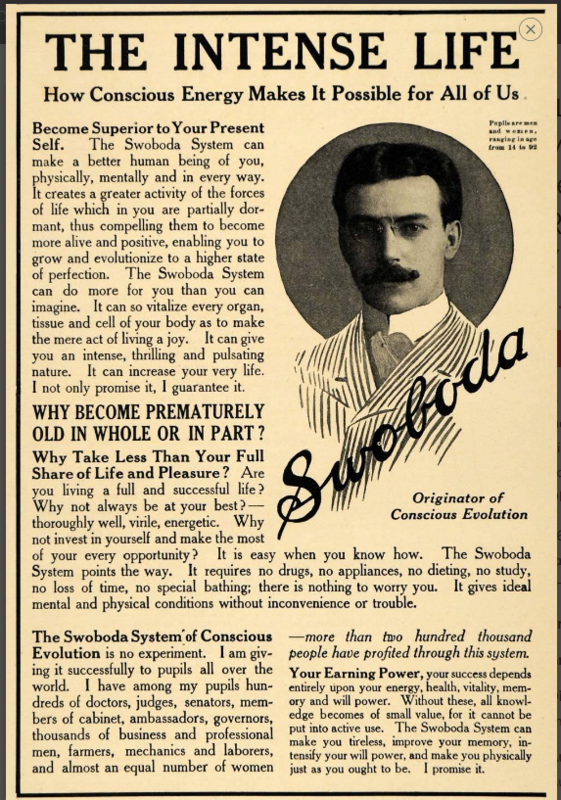 But unfortunately I haven't been able to find a copy of this pamphlet anywhere. The general concept reminds me of an earlier post from way back in 2012 — Jayne Mansfield's tips on exercising with a broomstick. Plays that also featured acrobatic & gymnastic stunts. I'm thinking Shakespeare should be performed this way. Hamlet's soliloquy delivered on a trampoline. It's like regular yoga, except with a lot of shouting, swearing, screaming, and heavy metal music. Also, the classes are held in the basement of a pub. I wonder if Patanjali would approve? 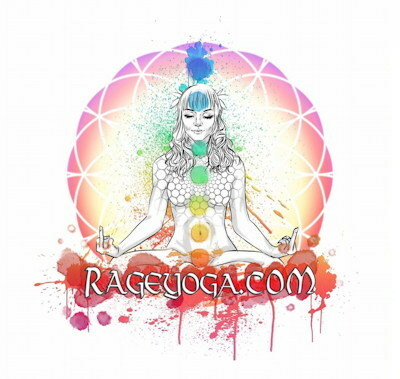 Rage Yoga's creator, Lindsay Istace, describes herself as a "professional weirdo." 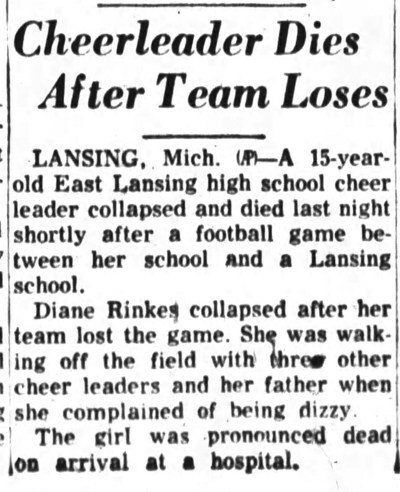 1953: Diane Rinkes, 15-year-old cheerleader for East Lansing high school in Michigan, gave it her all for her team, but it wasn't enough. Her team lost, and then she dropped dead. When I first read this story, I assumed that there must have been some kind of underlying medical condition that caused her death. 15-year-old girls don't simply drop dead for no reason. 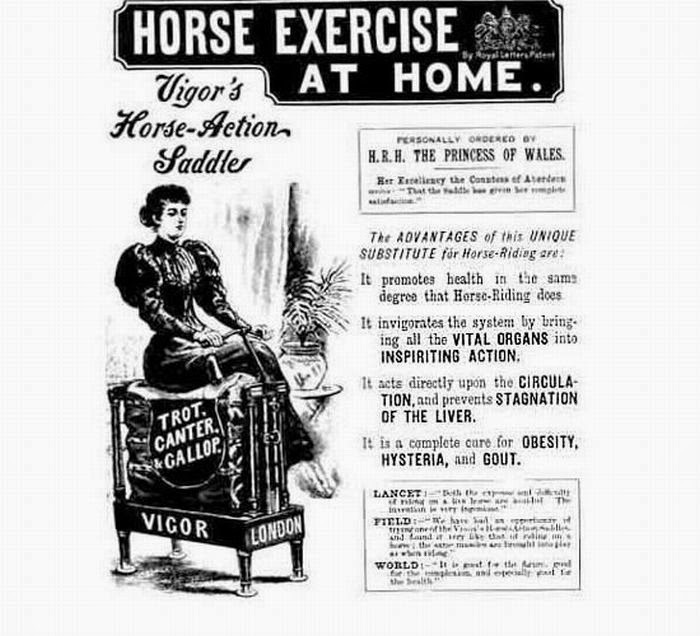 But in a follow-up report it says that the Coroner diagnosed the cause of death as "acute shock and acute circulatory collapse... brought on by overexertion." He elaborated that Rinkes worked herself up into such a "tremendous pitch of excitement during the football game" that it caused her death. So she died of over-excitement. You have to wonder if she would have lived if her team had won. Tega Brain and Surya Mattu have come up with an "art project" (Unfit Bits) that gives people practical tips on how to cheat fitness trackers, such as the Fitbit. Why would you want to cheat a fitness tracker? Perhaps because your employer is offering a financial incentive to wear the tracker and is then monitoring your data and sharing that data with an insurance company. So screw them. Take their money and supply them with a stream of bogus data. The cheat methods are as easy as tying the tracker to a pendulum or to the branch of a tree, to make it think you're walking around when you're really slouching in front of the TV. Notes Mattu, "We’re putting this kind of trust into devices that are very simple. Unfit Bits shows how silly the data is from these kinds of sensors." More info at Observer.com. Unfit Bits from Surya Mattu on Vimeo.